CHENNAIa��s young art scene is promising. That said, there are many challenges. Shalini Biswajit of Forum Art Gallery explains, a�?Ita��s a growing market and there is much scope for improvement. Chennaia��s art scene is yet to possess the vibrance of other cities. A�The opportunity for artists to work as cohesive units abound, as the Lalit Kala Akademi and Cholamandal Art Gallery provide a platform to nurture the same.a�? While the typical South Indian chooses jewellery over art today, Biswajit feels surviving in the market itself is a boon.a�?Young artists here somehow prefer changing jobs. Perhaps the environment is not inspiring enough to produce young talents,a�? observes Sharan Apparao of Apparao Galleries. Meanwhile, 61 year-old-veteran artist and former Chairman of Lalit Kala Akademi, RB BhaskaranA�feels, a�?The quality of work has improved, but the importing of artists from other cities is unnecessary.a�? We highlight some of the young, well-established talent who are trying to change the citya��s artscape. Years ago, little did Chennai-based Rama Suresh know that his works would adorn the walls of director Mani Ratnama��s home.A�Other long time patrons of the 37-year-olda��s art, comprise inventor GD Naidua��s family and the Ambanis. His hauntingly realistic still-life paintings have often been mistaken for photographs. A graduate of the College of Arts and Crafts, Suresh is quick to acknowledge his mentors a�� veteran artists KM Adhimoolam and Alphonso Doss. a�?My early years of rushing from college to work part time as an art director at Dalp Trade Pool, an Indo-German company, truly paid off. Constant touch with art and hard work are probably the most vital for any artist,a�? he shares. His still-life work is packed with rural themes from Rajasthan, Karnataka and Tamilnadu, with a recurrent aspect of his paintings being their main characters postured with their back to the viewer. The impasto technique is also a recognisable signature of his piece. An exhibition at Londona��s Saatchi Gallery early in his career hoisted him to shows at Germany, Nepal and Spain, and his plans to start a museum for contemporary art are likely to materialise in a few years. a�?I would say Chennaia��s art scene comes fourth nationally, behind Delhi, Mumbai and Bangalore. With support from the government and their families, artists here can be as good as those in Delhi,a�? says Suresh. Primarily inspired by his brother and senior artist RB Bhaskaran,A�Siva Murugan initially focused on still-life paintings during his days at College of Arts and Crafts. The over bearing influence of folk theatre and dramatics however, steered him into installations and sculptures. a�?I make my living through set design, costume design and lighting, all of which have taught me valuable lessons that I put to use in my installations,a�? says the 36-year-old. The glamour ofA�therukoothuA�and lighting caught his fancy and in time, he began to experiment with wood, bronze and glass. His fascination with myths and rituals also saw much of his work focused on episodes from the Mahabharata and Indian customs. A�a�?For over 10 years, I poured rustic, dark colours into my work because of my then state of mind,a�? he shares, adding, a�?But 2012 was the first time vibrancy dawned, where my collection Showing the show was a celebration of the serial light installations of Gods dotting TNagar.a�? A favourite at the Nobel Sage gallery and once part of a group show at Saatchi Gallery at London, Murugan admits, a�?Although I know little, I feel artists today in their 20s are much smarter and knowledgeable and they know what theya��re doing, so the scene is likely to change here in Chennai,a�? he concludes. Shaping poignant memories of life in bronze,A� at his native Kumbakonam, rural life remains a central theme of P Elanchezhiyana��s works. A few years into his career, London, Malaysia and Singapore galleries beckoned the 33-year-old freelance artist, who explains his foray into this art form, a�?While I was focused on painting, I was given an elective in sculpture at the College of Arts and Crafts. After dabbling in the art, I realised my heart was in it and passed on the opportunity to switch courses,a�? he explains. Armed with an M Phil in sculpture making, his work began to reflect his childhood images. Elanchezhiyan believes he speaks for himself through the sculptures, as they represent personal glimpses of Kumbakonama��s customA�ofA�jallikattuA�and respect for the bovine. The role of bronze as a primary medium was taken from when as a young boy, he was surrounded by bronze idol makers in his community. With accolades such as the All India Best Sculptor award from Tanjore University and Arayana in Kolkata, his future works will use a diverse range of mediums and explore the depths of man and animal bonds.A� Reacting to the uncertain market,a�?The quality of artists today is good and whoever wants to invest in art, will invest. I wholeheartedly believe in that,a�? he sums up. With natural mediums forming the mainstay of her work, Benitha Perciyal is one of few artists who has tasted success before turning 30. Based in Thiruvannamalai, Perciyal is a product of College of Arts and Crafts and her career began at Lalit Kala Akademia��s community spaces. a�?For artists who cannot afford studios beyond city limits, the space is a blessing. Strapped for cash and scraping by through art classes for children, I discovered new mediums like coffee and tea spills, going beyond watercolours and pastels.a�? 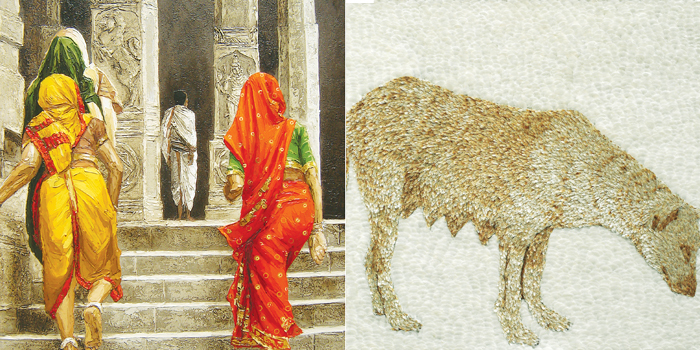 Perciyala��s art resembles a naturalista��s scrapbook as her work uses seeds, leaves and roots, minerals mixed with pigments like soil, cardamom and saffron to produce rustic shades on canvasses of handmade paper or fabric. With a heavy focus on psychological self-portraits, Perciyal shares, a�?Ita��s quite easy to lie to someone straight to their face, but when you see yourself in a mirror, you see two versions a�� what you want to say, and what you want to hide. I aim to capture that very duality.a�? A�Having showcased at USA, Denmark, Korea, London and major Indian cities, Perciyala��s take on Chennai is that, a�?Culture and history are seen as synonymous terms, and expounding on ancient art remains the priority for the government. But contemporary art makes culture as much as ancient art does, and ita��s time the government lent support to the art fraternity.a�? A hint of rebellion in her future works is expected as Perciyal focuses on protesting the threatening impact of globalisation on nature.